We were lucky enough to be able to go to Peru for our honeymoon. We were both blown away with the trip. 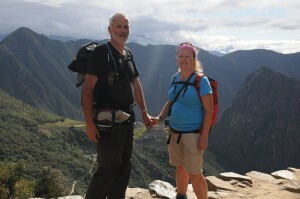 After completing the Inca Trail we spent a few days in the Amazon Rain Forest. No real lay in today. We are so used to getting up a silly o’clock we were both up at 7.30…. On a Sunday too.Still managed to visit Huaca Pucllana in the Miraflores area of Lima. This is a pre Inca pyramid type structure made up of adobe bricks stood on their ends with small gaps In-between. This made it earthquake resistant. Managed to bag a geocache on the way too.From there to the markets…. Last chance for June to get shopping :-). Then to Starbucks before we wend our way to the seafront to grab some food. Our bus leaves just after 4. Then home to the UK, a big bed and a little rain I fear. Cya soon folks… If we offer to show you some photos just bear in mind we have taken over 2000!! It appeared to rain all night… And the river Tambopata had risen by at least 2m, and this is a river that is over 100m wide for most of the way.Early river trip back to the airport but nearly foiled by the bus driver who collected us at the river port when he decided to go off road a little on the dirt track. We were well and truly stuck in the mud! We were all asked to get orf the bus as the guides pushed and dug. As is normal in situations like this half the coach became instant experts about getting stuck in the mud,comments like ‘ well he should have backed up and taken a run at it’ and ‘ he should have got us all out before he tried to drive out of the mud’ flew thick and fast. I am sure it was all this hot air that helped dry the mud a little and help the crew eventually launch forward out of the gloop and get us back on the road. The bus at 90 degrees to the roadSat at the airport just comparing it with Heathrow…. Well it’s just got a little better in that the air con has just kicked in… Someone switched on the 6 ceiling fans. Up at 6.00 ( I thought this was meant to be a holiday! ) and after breakfast down to the boat and upstream for a few minutes. Then back into the forest. At this point it was drizzling a little…. The aim was to see some parrots and macaws ( yes we know you can see them at the local zoo but not quite the same ) licking clay!!!! Yes these birds eat a fruit diet and need to lick clay to balance their diet ( how on earth did they find that… Did they start with tree bark moving onto bamboo maybe give a dead caiman a go before they found out clay was the answer? ).It took about an hour to get to the hide and just as we were on the home stretch the rain began big time. And it didn’t stop… In fact it still hasn’t stopped. But this is the rain forest after all. Frank our guide said that we had been the hardest ‘rained’ on customers he had ever had….. Thanks Frank knowing I am first at something helps a little.We managed to see a few macaws getting their fix of clay and they are quite impressive birds in their natural habitat. The walk home was ….. Wet and fast. The short boat trip was like a scene from Perfect Storm with a local Peruvian taking the role of George Clooney. Still we are back at the lodge now and a little dryer. But there is a little mound of wet cloths now that I guess won’t dry before we leave for Lima tomorrow first thing. June got a bit of a shock when she went to the bathroom in the night there was large frog ‘suckered’ onto the clear plastic shower curtain. Needless to say she didn’t have her camera with her.And we thought we had left the early starts on the Inca trail….Up at 04.30 for breakfast at 05.00. Then off for a walk in the forest. After about 10 minutes we came to a 30m high observation tower. From here we could see parrots, toucans, weaver birds and even caught a glimpse of a howler monkey. Then we continued into the forest stopping now and again for Frank, our guide, to point things out or to tell us what the latest sound we had heard was. The track led to a lake where we all got on board a canoe for Frank to row us about on whilst spotting the wildlife – birds, bats and fish including piranha (needless to say we kept our hands inside the boat!). It was then back to the lodge for a few hours r & r including lunch (no skimping on the food again!). So my reputation had arrived before me. The boat trip was a little more successful that the afternoons walk. We did see 1 caiman on the river bank. We also saw a line of leaf cutter ants on the way to the boat plus a few scorpions and spiders. Amazing. Today was the day when the group split up. Out of the 17 only 10 were taking the ‘ Amazon Extention’.Having said our farewells we were taken to the airport at Cuzco and then flew to Peuto Maldonado.From there, having left any kit we didn’t need in lock up storage, we were taken by bus along a dusty track for 45 minutes to a river port to catch a boat. The boat trip lasted 3 hours and we managed to see caiman, turtles, humming birds and the worlds largest rodent, capi something. We pulled up at a small dock and walked into the forest for about 10 minutes. Then we saw the lodge!! Bob was expecting a posh shed :-)… But it was a little more than that. It was a pucker lodge which even has electricity, albeit only between 5.30 and 9.30pm. It even has a bar :-). After a short introduction by the manager we were shown to our room. Double bed, hammock, shower, and open one side to the forest. Heaven – not sure I will be saying that at 03.00 with the night sounds of the forest and mosquitoes trying to attack through the Deet, citronella and mosi nets, but time will tell! You do have to be a little careful as it is so open, sound wise, you can hear what people nearby are up to. Nice cold shower, well it is about 27C at the moment and now we are thinking of having a beer. Even that it not bad value at £4.00 a large bottle when you consider the transportation costs:-). Back to the Sacred Valley for a session of rafting on the Urubamba river. Just eight if us and two boats. Great fun. It was a level 3 for those in the know, I’m not! !, and the first time either of us had ever done it. Probably not the last.Part way along we had the chance to jump off a bridge into the river if we wanted… Well it would be rude not to wouldn’t it?After 11 km we came to a spot where the organisers had set up lunch. So after getting the boats out and getting changed we ate in a summer house somewhere in the Sacred Valley. Up for an 8.00 start and caught the bus to Machu Picchu. It is walkable but as it takes 30 minutes by bus zig zagging up the mountainside we thought as the ticket was paid for we would use it:-)The site itself if massive. There are no words we can find that would do it justice. Even the photos we have taken will only get part of it over. We had another guided walk around the site by Hector our guide. He has such a deep knowledge about the area including the geology, botany, history, there wasn’t a question he couldn’t answer.Back to the village and a coffee or two and a bit more shopping for June. Will be sad to leave here but tomorrow we are white water rafting and then on to the Amazon for a couple of days. This trip is just wonderful. We are both very lucky (bit of an understatement really). Later we take the train back to Cuzco. To give an idea of the terrain the 90km (about 60 miles) or so journey takes 3.5 hours as it weaves around the mountains following the course of the Urubamba River. Easy peasy lemons a squeezy. Up at 5.00 again today but mainly due to voting in Peru and the Porters need to be back in their village in order to vote. If they don’t the get fined 150 soles ( just under £40 which is a huge amount to these guys)Still it was a great start to an easier day. The route took us past several Inca ruins. 4 days, 3 nights, 48 kms, lost count of no of steps but in excess of 2000 and highest point reached 4200m ( just under 14,000 feet). Over all the best outdoor experience either of us have ever had. The guides were brill. Good sense of humour, vast knowledge of the area, they were there when you needed them and not when you didn’t. A good pace bearing in mind we were a mixed group with some not maybe at full fitness ( including Bob on day two). Certainly if you’re thinking of doing this trek DO IT !! And on our experience we would have no hesitation in recommending Explore Worldwide, who use local guides with lots of local knowledge. The porters were great. As you arrived at the camp site we were greeted with Coca tea and bowls of water to take a wash. Same in the morning. Such service at such remoteness. Dead Woman’s Pass and beyond. Thankfully Bob is feeling better to day. Still not eating fully but much better.5.00 wake up call!!!! With snow falling.Breakfast and Coca Tea, which helps with altitude sickness they say. Left the campsite at 6.30 for a 400m climb to Dead Woman’s Pass, the highest point on the trail at 4200m, so called because of the rock formation. Personally I think they have been drinking too much Coca Tea. The rock formation left a lot to the imagination :-). As the saying goes, whatever goes up must go down… And so did we. More steps. As the Incans were very small people why oh why did they think it necessary to build such high steps? The scenery still manages to impress us all the time. We continued to a second pass where we had an Incan Ceremony to bring us luck. Then another steep descent and short climb to our lunch site. By this time the porters had overtaken us, erected a mess tent and cooked us a 2 course lunch! After lunch the climbing and descent was less severe. After just over an hour we reached our third campsite. Top advice. If you intend doing the Inca Trail do your utmost to avoid getting Inca Belly on the first night! !Up at 6.00 for tea and breakfast. Then we all introduced ourselves to the porters and them to us.Left about 8.30 to pass almost straight away another Inca ruin. This was a long day walking ending up at 3850m with a total climb of over 1100m (3600 ft), which does not sound too much but at this altitude is hard work. The last 2 hours was 500m continuos climbing up stone steps. To be honest Bob does not remember too much of it in detail. The night before it was touch and go if he could even carry on. The scenery continues to be stunning. Every corner you turn gives you a more and more spectacular view. The climbing uphill was tough but we did it. The porters are amazing. They leave after us having packed all the tents etc up and over take us on the trail, often running, to get to the next stop be it lunch or overnight camp site. The food is plentiful and we have certainly not been hungry. 08.30 start and all our kit loaded in the bus that was going to take us to the start of the trail.Stopped at Ollantaytambo to take a look in a typical Incan style house. It was here too we first saw our porters who were loading our kit into a truck that was to take them to the start point. It was very reassuring to see our sleeping bags being thrown on board.We were then taken a few Km to where we were to start from but first we were fed with rice, mince and lupins. As we ate we watched the porters weigh and pack the kit they were to carry. It appeared that no one really wanted to carry 3 dozen eggs though. Through the start check point and at last onto the trail. To be honest we only did about 4 miles but at this altitude, 2600m, it was a little harder that back in the UK. As we approached the edge of a down hill section we stopped and could see our campsite below. The porters had raced ahead and almost had finished sorting out the whole site…. erecting 9 x 2 man tents, a mess tent and a cooking tent. The tents are 2 birth and somewhat compact. Not too sure Bob can lay full out, but, you can’t beat the location at the foot of some Inca ruins and next to the Urubamba River. Today was our last day before the 48 km hike starts.First place on the tour was Sacsayhuaman. This is a large Inca ruin above the city of Cuzco. Typical Incan stone work but some massive blocks. Including one at 30 feet. Note the Incan flood lights. How advanced were they?We then walked down into the old town part of Cuzco and saw where the Spanish destroyed the Incan temples but then built over them. You can see clearly the remains of the Incan building at the base. Still after the 1650 and 1950 earthquakes it was the inca buildings which were still standing. We also saw the 12 angled stone which when you consider what tools they had is quite a feat. ( sorry no picture taken on the phone taken ). Lunch at our, now, favourite coffee bar…. Well now is not the time to experiment with food. It seemed most of the group felt the same way as they slowly joined us. We spent the rest of the afternoon continuing our cultural tour of Cuzco finishing off as the sun went down with a large Cuzquena beer, sitting in one of the numerous small squares. Here we met Angela. A 12 year old who, like many adults and children, try to sell the tourists various craft items. She was a real character. She knew who our PM was and the name of our queen and the capital of England was London. Her English was better and clearer than some teenagers we have met in the UK. Yes we did fall for hers sales patter and spent a whole 5 soles ( £1.25). She left us with a smile and moved on to the next table of Brits who were not so easy to charm. After a quick stop at the supermarket for essentials for the trek (chocolate, energy bars and toilet paper) it was back to the hotel to pack again. A small bag of essentials to last 5 days weighing no more than 7kg and the rest stays locked up in the hotel until our return. Today we went to the Sacred Valley. As we see more and more of this area we are growing more and more fond if it. It is truly beautiful.On the way to Pisac Market we stopped to take photos of the valley ( we will publish a link to our best shots once back in the UK and we have uploaded them to our Google Photos).Once at the Market we visited a local Silver jewellers that actually make the items on site. We managed to find each other a ‘special’ little pressie and the bank account only gave a little sigh. From there we went to Ollantaytambo – almost a mini warm up for Machu Picchu, where we climbed 240 steps to the top. This is the site of an Inca Fortress and Terraces. While most of the terraces have been reconstructed the main section at the top is original. It is amazing how the Inca managed to build walls without using mortar and getting the blocks to fit so flush. There is no gap at all in between the blocks and the ones at the top are about 10 feet high by 4 feet wide. These blocks were quarried from a hill side 12 kms away the other side of the very steep valley. On the way back to Cuzco we stopped at a house to try some Chicha. This is a natural alcoholic drink made from maize. I think we were all expecting something a little rank but were pleasantly surprised. The girlies had a special version made by adding strawberries. After a more respectable start of 9.00am it was off to see some of the sights surrounding Cuzco. Our first stop was the village of Chinchero where they produce textiles using traditional Inca methods. We were given a demonstration of how the wool, sheep and alpaca, was spun, dyed and woven before being let loose in the shop. It was fascinating.From there to Moray where the Incas farmed on terraces in a bowl on the side of the mountain. This means it had it’s own micro-climate which acted like a greenhouse and a different crop grew on each level. Our last stop was the salt pans near Maras an almost deserted former colonial town. There are approx 3,000 pools and a person would own 5 or 6. The source of the water is deep inside the mountain where the water passes over a very large block of salt before exiting out into the valley and the pools. On the health front we both seem to be almost back to normal and are at least eating again…..
Our favourite coffee shop so far… Trotamundos in Plaza De Armas, Cuzco. An even earlier start today but managed to get the flight OK…. despite the coach driver’s attempt to stall us by turning up at the airport at 6.00am rather than the hotel.Fantastic views as we flew to Cuzco. A little excitement as we were taxiing after landing at Cuzco. June looked out of the window to see 5 foot of flame coming out of one of the engines that started licking around the edge of the wing. This lasted for a few seconds before the pilot shut everything down PDQ.We were joined by two airport fire engines faster than a pilot can walk to the loo when it’s his round. After a short while we were moved and allowed to disembark. So on to the city of Cuzco. The hotel is a renovated colonial building with all mod cons. Much of the accommodation we have stayed in was described in the brochure as basic but we’ve had no complaints so far. Alex the guide took us for an orientational walk to the main square before we had lunch and the second decent cup of coffee since we’ve been here (well for June anyway as all the milk so far has been evaporated). The extra days in Cuzco mean that we have time to have some rest and hopefully recover from all our ailments before heading off on the trail. Also allows us to get some laundry done properly – one pair of Bob’s underpants hanging out of the window to dry is probably enough for the locals! On the road at 06.30!!! To go to Colca Canyon.Colca is the second deepest canyon in the world, the deepest one being Cotahuasi Canyon also in Peru. The early start was so we could see condors at Mirador Cruz del Condor.What a show they put on for us too. There must have been at least 12 condors soaring on the thermals at the cliffs edge. As far as the canyon is concerned we both agree it is one of the most beautiful places either of us have ever seen (apart from the inside of a pilots wallet of course). It is more than 1km from cliff’s edge to river below. The photos we took will not do it justice I feel. From there, and via last nights hotel to collect one very poorly member of our group who had spent the morning in bed, we made our way back to Arequipa. Latest Puno news is that we all catch the 8.00 flight out of Arequipa to Cuzco tomorrow and spend 2 extra days there. Could be a lot worse we could stuck in Puno, which has been under effective siege for quite a few days now. Today we made a way to Chivay via …. The highest point we will reach this trip 4800m which is 3 miles high!! Highest either of us have ever been. On the way to the 4800m mark we stopped quite a few times. The guide said it was to see the llamas and alpacas. I think it was more to get us used to the height. At that height even walking a few hundred yards can take your breath away. June suffered a little with soroche ( altitude sickness) but recovered very quickly once the guide rubbed her down with some alcohol. He explained that they had forgotten the oxygen so if go had got any worse it was going to be ‘mouth to mouth’! !The scenery was stunning again. Volcanos all around us.We stopped at the summit and even there the local had stall out selling their goods. There was a geocache only a couple of hundred feet away but we didn’t manage to get it …. Maybe tomorrow when we return that way. The hotel in Chivay is very nice with free wifi again!! The latest news about the next leg to Puno is that it has been cancelled. So we won’t be getting to see lake Titicaca or Puno. We will, however, be spending more time in Cuzco which will help us acclimatise for the Inca Trail. Nice lay in today as we are not leaving the hotel until 9.00 for a short walk to Monasterio D Santa Catalina.Before leaving though Alex, our guide, tells us there may be problems ahead at Puno. There are strikes by the miners there (no not the children but the people who work below the ground) that are bringing the city to a grinding halt. Apparently there are 3,500 tourists trying to get but all the roads are blocked. Hey hoe… It will be what it will be but even if we have to miss Puno hopefully we’ll find a way to Lake Titicaca.We as I am sure all our readers are keen to know, Inca Belly is taking a hold of the group and desperate times call for desperate measures…. Fortunately the facilities are a little better than those of the old mother superior at the convent! From there it was on to the Cathedral on the main square which was very simple yet beautiful. We were also taken up to the bell towers (one of which had to be restored after the last big earthquake in 2001). Despite not having done much other than sit on a coach for the past four days a siesta was required this afternoon! The altitude is noticeable even at this level (2,335m) but we should acclimatise albeit slowly after drinking plenty of coca tea. Our expression for the day. We have never seen so much desert. This was our fourth day of driving through desert scenery. Having said that the view is often breath taking. It was our longest day in the coach and ended up in Peru’s second city Arequipa. The hotel was formerly a colonial palace, I doubt though in colonial times they had wifi.Bob is suffering with Inca belly. Not good when you have to spend 7 hours on the coach and arrive in a city that is famous for it’s chocolate. and then the Antonini Museum which had all kinds of artefacts on display ranging from disformed skulls to cactus needles used for sowing / tapestry.After that we stopped at Taller de Artesania, a local pottery using traditional methods and designs.We then hit the Pan American Highway again heading south towards tonight’s hotel. 170km through some of the bleakest but constantly changing desert scenery. Hotel Puerto Inka is a bit of a find being nestled in a small cove on sandy beach with nothing else around it. Tonight we will sleep not with the sounds of lorries thundering past but with the waves of the Pacific crashing on the rocks below. Before leaving Paracas we took a boat trip to Islas Ballestas. Fast boat to the islands which was the home to seals, Peruvian Boobies and cormorants. One or two pictures taken here as you can imagine! Most of this part of Peru is desert but we had lunch at a beautiful oasis. There were massive sand dunes and several restaurants. We shared our lunch with another couple on the tour and with a very loud Australian. Well she was several tables away but talking to someone on skype and clearly didn’t see the need to lower the volume of her voice. Still it was beautiful and reminded us of Meski oasis in Morocco. After lunch we drove for miles and miles across desert. We hadn’t realised there was so much desert in Peru but nothing like the Sahara – in fact like nothing like we’ve seen before. Then to the Nascar lines. Due to bad safety records with flying trips over the lines this option wasn’t open to us. Instead we climbed a viewing tower… Well I say a viewing tower I think it was an old water tower that had been moved. The Nascar lines were seriously underwhelming. We both expected a little more. The Peruvian government had also chopped one in half when it built the highway. However the scenery was fabulous …. Stunning !!!!! Left the hotel at 8.00 to travel south out of Lima. We passed a lot of poverty along the way. It appears in Peru a lot of people move to Lima from other part looking for a ‘better life’. Typically, like all of these type of hopes, it never materialises. However in Peru the folks can just find a plot of open land and put up a temporary building for 12 months or so. Then they approach / demonstrate to the government and they get the basic services…. Water, albeit via a bowser and electric. The result is still very basic by UK standards but at least a part way to their wish of a better life.We stopped at Pachacamac which is a very large site that appears to have hosted many early civilisations. The area has, over many years, been excavated by various archeologists from a few nations. The museum is small and only had a few exhibits on display but explained the chronology of the area really well. After a trip around the ruins we managed to grab a quick coffee…..ah…The geology of the area is fascinating. On one side of the road we saw conglomerate from really heavy floods moving tonnes of rock while on the other side of the road was solid rock. The whole area was desert and the dunes stretched for miles. to a restaurant and a plate of Ceviche and beer. Hotel not quite up to last nights Best Western but still very comfortable and probably quieter. Later in the afternoon we visited the National Park at Paracas. To get to it we were driven across more desert landscape. The sand dunes here were yellows and redish. At the second stop we watched the sun go down. The redish glow across the sandy desertscape was beautiful. Total of 17 in the group of all kinds I feel:-). Leader is Alex a local from Cuzco. He will be with us all the trip. Only one of the group is not doing the Inca Trail.First hotel in Lima very nice. Much better than we expected. Even free wifi. We had a short walk towards the local mall that over looks the sea.Coach leaves at 8.00 tomorrow. Off down the coast. Well we have the house sitter arranged ( well can’t let the grass and plants die can we?) and almost packed.Did Paddington really have this much stuff when he left deepest darkest Peru? I somehow doubt it.Early start tomorrow and we aim to update this as often as we can. Which bearing in mind we are on the Inca Trail and in the Amazon for part of the trip… May not be as often as we would like.